Wondering how to invest in the vanadium industry? Learn about supply and demand, as well as firms involved in the vanadium space. Vanadium is a silvery-gray transition metal that was first discovered in 1801. It is named after Vanadis, the Norse god of beauty, and occurs in about 65 different minerals, including vanadinite, carnotite and patronite. The metal is mined as a by-product of other metals, and exists in deposits of phosphate rock, titaniferous magnetite, uraniferous sandstone and siltstone. It is also present in bauxite and in carboniferous materials such as coal, crude oil, oil shale and tar sands. Many investors believe the vanadium industry is compelling and are interested in getting involved in the market. Read on for a brief overview of the metal, from supply and demand to how to invest in this compelling industrial metal. China was the world’s largest producer of vanadium in 2016 by far, contributing 42,000 MT to the vanadium industry. It was followed by Russia at 16,000 MT and South Africa at 12,000 MT. China also has the highest vanadium reserves globally. Most vanadium in South Africa is mined from a formation known as the Bushveld Igneous Complex, and until 2014 the country was the second-largest vanadium producer, accounting for 14 percent of the market. However, in 2015, Evraz Highveld Steel and Vanadium’s Mapochs mine closed, leaving only two vanadium-producing mines operating in South Africa. In terms of demand, Roskill’s latest vanadium market report says that 91 percent of vanadium is used as an additive in steel to make it lighter, stronger and more resistant to shock and corrosion. The metal is often used to make parts for airplanes, as well as crankshafts, axles and gears. Less than 0.1 percent of vanadium is needed to double the strength of steel, and although other metals — including manganese, molybdenum, niobium, titanium and tungsten — can be interchanged with vanadium for alloying with steel, there is no substitute for vanadium in aerospace titanium alloys. Vanadium alloys are also used in nuclear reactors because they have low neutron-absorbing properties. Vanadium oxide is used as a pigment for ceramics and glass, and also acts as a catalyst in the production of superconducting magnets. Vanadium redox batteries are generating excitement because they are reusable over semi-infinite cycles, and do not degrade for at least 20 years. However, these batteries are quite large and are better suited for industrial or commercial use than for use in electric vehicles. Roskill expects the market for stationary energy storage to increase from less than 2 GWh today to 16 GWh by 2026. The firm notes that vanadium redox batteries currently account for just a fraction of the energy storage market, but even slight growth in market share could potentially add tens of kilotonnes of demand to the market. Roskill predicts that vanadium prices will recover from their current level and peak around 2019 or 2020. The current price of ferrovanadium, an alloy of iron and vanadium, is about $21 per kilogram. Vanadium bullion is available from private individuals, but the metal is not publicly traded and so most experts do not advise investing in physical vanadium. Instead, many investors interested in the vanadium industry choose to invest in companies that are focused on the metal. Largo Resources (TSX:LGO) continues to ramp up vanadium production in South America. The company owns and operates the Maracas Menchen mine in Brazil, and its goal is to reach annual vanadium output of 9,600 tonnes. The mine started producing vanadium in August 2014, and Largo says it is the highest-grade vanadium deposit yet discovered. Australian Vanadium (ASX:AVL) owns the exploration-stage Gabanintha vanadium project in Western Australia. The company said it has agreed to sell the rights for base metals at the project to Bryah Resources, but retains the rights to battery metals. Bushveld Minerals (LSE:BMN) recently signed a conditional purchase agreement to acquire the Vametco vanadium mine from Evraz Group. Bushveld said it is focused on vanadium redox batteries. Energy Fuels (TSX:EFR,NYSEMKT:UUUU) is primarily focused on uranium, but processes vanadium at its White Mesa Mill in the US. 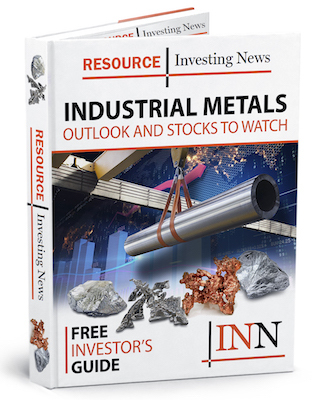 Intermin Resources (ASX:IRC) is primarily focused on gold, but does have one vanadium-molybdenum exploration-stage project in Queensland, Australia. Prophecy Development (TSX:PCY) is acquiring the Buttercup vanadium project in Quebec, Canada. It has vanadium projects in Ontario, Canada and Nevada, US. Syrah Resources’ (ASX:SYR) main asset is the Mozambique-based Balama project. It primarily includes graphite, but also has vanadium potential. TNG (ASX:TNG) is developing its Mount Peake vanadium-titanium-iron project in Australia’s Northern Territory. Vanadium One Energy (TSXV:VONE) announced in March that it is in the process of acquiring a 100-percent interest in the Mont Sorcier vanadium-iron-titanium project in Quebec. The company also has a manganese project in BC. VanadiumCorp Resource (TSXV:VRB) has an early stage project known as Lac Dore, and the company believes it can become a big-time North American supplier and major player in the vanadium industry. Did we miss a publicly traded vanadium company that you think should be included in this article? Please let us know in the comments. And don’t forget to follow us @INN_Resource for real-time news updates! Please add Prophecy Development Corp (PCY.to) to the vanadium plays. Thanks for the comment! We have added Prophecy Development.